The good old days of wood handled lids on the Weber kettle are long gone. In it's place are the plastic jobs that really hold the heat. They get too darn hot to work without a glove. Forget that - I smell a mod coming on. 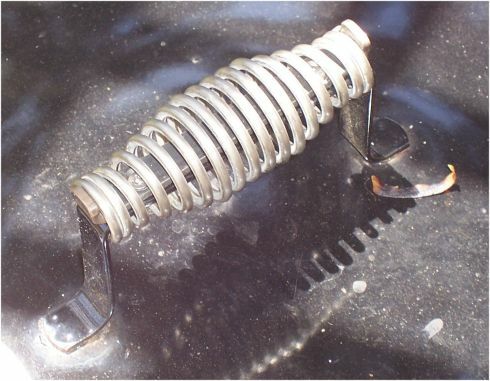 The wire spring type handles are used with success in many BBQ and grill applications. Fitting one to the Weber kettle lid handle would be a fun project. I purchased 3 spring handles on-line. I only needed to retrofit one Weber kettle, but 3 would give me some wiggle room, letting me cut, grind, and modify springs until I found a proof of concept. If you remove the screws that hold on the plastic handle, you wind up with a simple metal strip that is spot welded to the lid. The plastic handle is designed to attach to this metal strip with one screw. 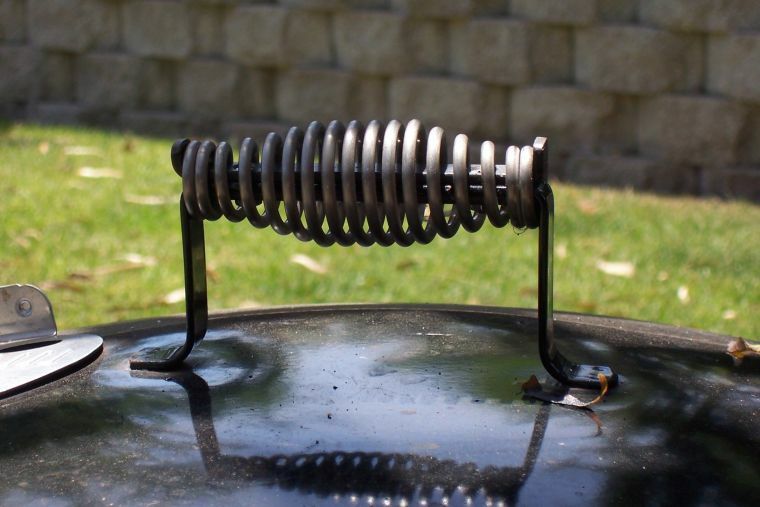 The problem is that there's no way to get the spring onto the handle without cutting the metal strip. Once cut, you need a way of repairing the cut so you don't wind up with garbage. In this mod, I took a piece of 3/4 inch wide x 1/8 thick cold roll steel stock. I made the piece you see in these pictures. 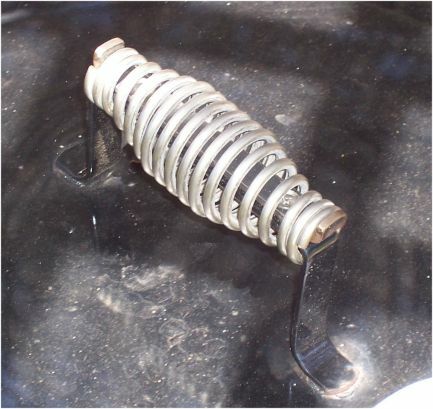 It helps retain the spring which is under pressure in this application. Screws repair the cut in the original handle strip. A bench vice break helped me make the bends - which were spaced so's to match where the spring would but up against the original strip of handle metal - meaning the spring would be retained top and bottom. Installing these bits was very difficult, and took a lot of patience and finesse. To do it over again, I would have tapped a thread in the holes of the lid handle metal strip, instead of using hex nuts to bolt it all up. The results of this modification are very positive. Gloves are no longer needed to handle this lid. The handle remains cool to the touch no matter how hot a cook you're doing. A nice successful modification.